In recent years, many different feedback controllers for robotic applications have been proposed and implemented. However, the high coupling between the different software modules made their integration into one common architecture difficult. Consequently, this has hindered the ability of a user to employ the different controllers into a single, general and modular framework. 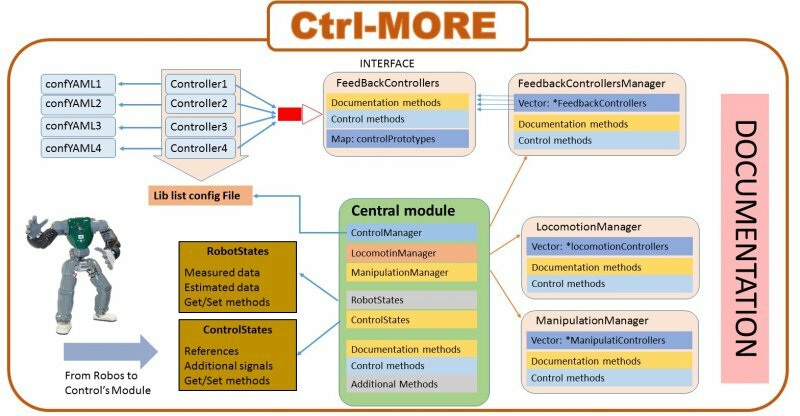 To address this problem, we present Ctrl-MORE, a software architecture developed to fill the gap between control developers and other users in robotic applications. On one hand, Ctrl-MORE aims to provide developers with an opportunity to integrate easily and share their controllers with other roboticists working in different areas. For example, manipulation, locomotion, vision and so on. On the other hand, it provides to end-users a tool to apply the additional control strategies that guarantee the execution of desired behaviors in a transparent, yet efficient way. The proposed control architecture allows an easier integration of general purpose feedback controllers, such as stabilizers, with higher control layers such as trajectory planners, increasing the robustness of the overall system. reduce the gap between control developers and control users. integrate control developments over different modular software solutions. permit the developers to create their controllers in a common interface to shared them. Permit the user to apply existing control tools in their own modules in a simpler and clearer way.